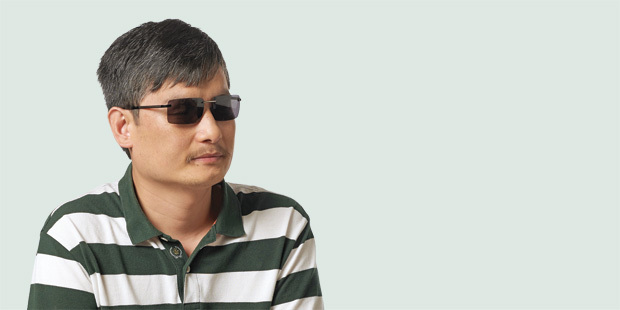 Henry Holt announced in July that it will publish the memoirs of Chen Guangcheng, a self-taught Chinese lawyer, in fall 2013. Chen’s story promises suspense and thrills. After his dramatic escape from unlawful house detention in Shandong Province set off a diplomatic crisis, Chen and his family negotiated a way out of China and into NYU Law. Blind since infancy, Chen had earlier spent four years in jail after angering local officials by filing a class action lawsuit in 2005 on behalf of thousands of women who suffered forced sterilizations or late-term abortions. Over the summer, Chen; his wife, Yuan Weijing; and an interpreter met with Public Affairs Officer Michelle Tsai to talk about his thoughts on U.S. and China law. American constitutional rule with Professor Frank Upham. It’s interesting how, in the Constitution, Congress holds much of the power. In reality, the president might hold more power than prescribed in the Constitution. This makes me think that, in order for the government to operate properly, executive power might need more checks and balances. What do you think of the recent U.S. Supreme Court decision on our healthcare laws? I am not familiar with the specific content, but one point is, in America, there will be a clear exposition of ideas, of the verdict. In the end, even the president, with all his power, is subject to a court’s ruling. This is an extremely good social mechanism. If many things are prolonged indefinitely or drowned like a stone in the sea, this would severely limit a society’s production and development. How does this compare to China’s supreme court? In 2007 or 2008, I submitted the appeal for my own case to the Supreme People’s Court through various channels. There is no doubt that the Court received it, but to this day they have not given me a response. The highest body of the judicial system has not responded to a citizen’s appeal for years. This is a very big difference. With respect to my case, then, does it matter at all whether or not this court exists? Do you expect things in China to change with the turnover in political leadership this fall? It is not important whether the leaders change. The most important thing is whether citizens have the consciousness to recover their own rights. Just like with our things: If I take your cell phone, and you do not ask for it back, you tacitly approve of my taking it away, and you might have fewer possessions in the future. But all in all, the awakening of the Chinese people is occurring at the pace of a thousand miles a day. This is very encouraging. And the speed is accelerating. This historical development is inevitable—I don’t think any force can obstruct it. What misunderstandings do you see between China and the U.S.? When Americans discuss the problems of China, it is usually just about the urban conditions, not about the rural village populations, which make up about 80 to 90 percent of the country. I don’t think people understand at all or nearly enough about rural village society and conditions. Chinese people have a dire lack of understanding about America, because it is only cases like those about American firearms gone amok that everyday Chinese people might know. Can you be an influence in China from the U.S.? There is a Chinese saying: “It is for people to plan, and it is for the heavens to determine the results.” My imprisonment and illegal detention add up to about seven years. During that time, I was entirely unable to make even a phone call to the outside world. And yet do you think my influence has increased or decreased over these seven years? How do you feel about life here? This is a big topic! With regard to everyday life, there is a greater variety of food. As far as people, I don’t think there is that great a difference. Every people, every country shares certain commonalities, such as a sense of good and bad, or innate kindness. The free flow of information strikes me as the most prominent point of difference. This Q&A was translated by C. J. Huang, edited, and condensed.